The Land Rover Discovery made its U.S. debut for the 1994 model year, as the SUV craze was underway and Ford Explorers and Jeep Grand Cherokees became ubiquitous on the highways and byways of America. Offering the go-anywhere capability of a Jeep, the brand cache afforded by its famous Range Rover stablemate, and a unique design that was at once awkward and attractive, the Discovery was a sales hit. Over the generations it has undergone a series of evolutionary and revolutionary changes, leading up to the modern and nearly unrecognizable fifth generation. When it came to SUV’s in the 90’s, image was everything and shoppers were more than willing to sacrifice practicality to drive something that looked like it could traverse through a jungle. Just knowing that your SUV could crawl up a mountain or forge a stream conveyed power to SUV buyers at the time, fuel-economy be damned! Perhaps the Land Rover Discovery took the off-road-ready look to its highest level, offering available brush guards, off-roading accessory lamps, a rear-mounted spare tire, mud flaps, an extra sunroof and side roof-mounted windows meant to allow passengers to take in the outside views while on safari. It was over-the-top and superfluous, but somehow it all worked. The Land Rover Discovery was the height of style in the mid-90’s. A subsequent update for the 1999 model year saw the styling refined, with the most noticeable differences being high-mounted tail lamps and a more substantial front bumper. The classic design elements were all carried over and the interior was slightly improved to provide a more comfortable experience, however many of the practicality compromises remained. Referred to as the Discovery Series II, this generation was a faithful update to the original and retained its unique look and character. Major changes came in the form of the third-generation Discovery, referred to as the LR3 in America, which went on sale in the U.S. for the 2005 model year. A significant overhaul saw interior space increase significantly and a brand-new platform meant that the LR3 was much more civilized and sophisticated, better suited to handling daily driving duties. Although off-road tech remained in place, this generation became too large for some off-roading purists because its dimensions made it difficult to maneuver in some situations. Stylistically, the LR3 was an ultra-modern interpretation of the classic Discovery design elements. In the processes of modernizing, character lines and motifs that made the Discovery so distinct were smoothed out, toned down and stretched over a super-sized body. The rear-mounted spare tire gave way to an unadorned tail end. Although it still looked unique compared to the competition, the LR3 lacked the rugged proportions and charm that made its predecessors so appealing. It became anesthetized. A mid-cycle refresh saw the LR3 named changed to LR4, and marked a return of some of the Discovery’s charming design elements. An updated front end swapped out ultra-modern headlamp fixtures with a more classic design and a grille treatment borrowed from the Range Rover gave the face of the LR4 more personality than the LR3. The removal of excessive cladding visually gave the LR4 a lighter and more athletic appearance, making it appear less ungainly although the massive proportions remained. Equipped with the right wheels and in certain complimentary colors, the LR4 was able to recapture the spirit of the Discovery and Discovery II. There was hope that the next update would see an even further development of the styling’s return to more classical forms. However, that would not be the case. 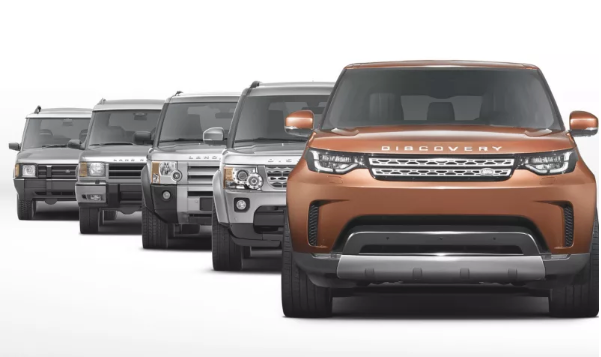 2017 saw the release of the LR4’s successor, now officially called Discovery again in America. Taking on a whole new design aesthetic heavily influenced by the Range Rover Sport and Range Rover Evoque, the fourth-generation discover was the most radically updated, with soft contours, less height and horizontal tail lamps replacing vertical ones. The latest Discovery is virtually unrecognizable compared to its predecessors, and no longer stands out from the crowd in terms of styling, although efficiency, interior packaging and driving dynamics are all significantly improved. There is a chance that echoes of the distinctive Discovery of old will appear in the styling details of the resurrected Land Rover Defender, which is expected to be revealed soon. While the Discovery has shed much of the character that made it so endearing, perhaps the Defender will carry forth the brilliant design and styling that made the 1994 Land Rover Discovery an icon. Previous Post - Previous post: Which Generation Mercedes-Benz S-Class Looks Best?